How far would you go to take part in the sport you love? Stuart Irvine, from Lerwick, frequently travelled the 450 mile-round-trip from the Shetland Islands to Aberdeen to box. With no official club on the Shetland Islands the 25-year-old joiner, who is nicknamed the "Road Warrior", learned the basic skills by watching tutorials on the internet. After winning his first official fight at the end of 2014, he is now in the process of setting up the first boxing club on the islands. 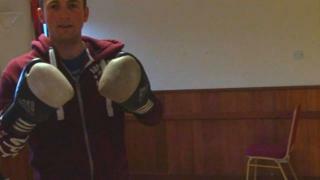 BBC Shetland's Daniel Lawson caught up with Stuart to hear about his boxing journey. If you fancy giving boxing a go, visit our Get Inspired boxing activity page for information on how to get involved.